We are so excited to announce a new location for our 25th anniversary Race! The Race for the Cure will be a community and family friendly walk. Due to the costs of chip timing a 5K the Lowcountry decided to put more funds towards our mission to support our local communities. We understand that some may be disappointed with the changes but our Affiliate aims to be good stewards of your contributions. You are more than welcome to run the course if you like but it will not be timed. About the Race for the Cure. The Susan G. Komen Race for the Cure® Series is the world’s largest, most successful fundraising and education event for breast cancer. The race series includes more than 140 events on four continents, with over one million participants coming together every year to take part in the fight against breast cancer. 75 percent of the net income stays in our community to help fund local programs offering breast health education and breast cancer screening and treatment. The remaining 25 percent goes toward Susan G. Komen® Research and Training Grants program. 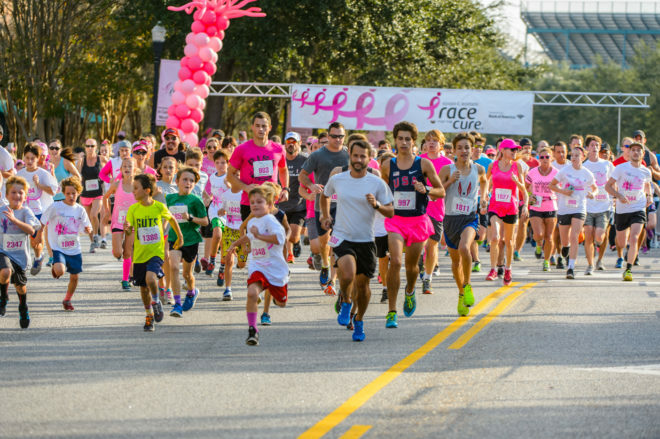 In addition to raising funds for the breast cancer movement, Race for the Cure® also increases awareness, celebrates breast cancer survivorship and honors those who have lost their battle with the disease. Every year, in cities around the globe, our allies Race for the Cure® and prove they are More Than Pink™.